Dracula – Sophie Greenham and Bart Lambert (Mina and Jonathan Harker). Between 1890 and 1895, the Business Manager (Bram Stoker) from the Lyceum Theatre could be found in the London Library pouring over some very interesting books as diverse as “The Devil: His Origin, Greatness and Decadence” through to “A Glossary of Words used in the Neighbourhood of Whitby”. Subsequent research has shown that during this time, Bram Stoker was working on one of the most famous works of fiction known to humanity. 121 years later Creation Theatre have returned to the London Library to bring Dracula home once more. This version of Dracula is very different to any other you might see. 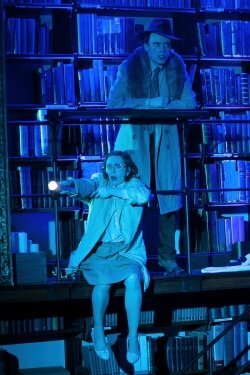 For a start, it takes place in the reading room of the library, an atmospheric location that is steeped in history and which Director Helen Tennison uses very effectively. The second unique thing about this production is that there are only two cast members (Sophie Greenham and Bart Lambert). And finally, there is a distinct absence of blood, gore and a Transylvanian noble with a dislike of mirrors. This is perhaps the most intriguing of the decisions taken by Kate Kerrow in the adaptation of the book and, on the whole, it works quite well. Dracula is always there. Like a shadow in the darkness, a hint of movement in a blind or something just glimpsed out of the corner of the eye, the presence is felt but never seen. However, most of the other well-known characters are maintained, Jonathan, Mina, Renfield, Seward and, of course, Van Helsing. All played well by Sophie and Bart, aided by some very effective AV, sound and lighting by Eve Auster, Matt Eaton and Ashley Baie respectively. I haven’t really mentioned the plot so far and that is a deliberate act on my part. Those of familiar with the story will know what to expect – albeit in a fresh and different way – whilst those that are not in the know, need to see the production with no foresight as to where they will be taken. Overall, I am in two minds about this version of Dracula. My main issue is the story itself. To me, losing Lucy as an actual character was a very negative move as the relationship between Mina and Lucy is, in my mind, quite pivotal to the narrative and losing that makes it more difficult to understand why Mina has – and again, no spoilers – taken her unwell and obviously suffering husband to Lucy’s house in the first place. Having said that, I liked the way the story was told and the fact that Mina was a much stronger character than in most versions. I think the two actors did very well in their roles, often swapping characters virtually in the middle of a sentence. The AV was an excellent addition, bringing elements to life that would have been very difficult to show without it. And the overall staging, in this wonderful location, worked extremely – although there were issues of sightlines from my seat a couple of times when a pillar completely obliterated the character on the walkway. Overall, while I felt there were certain elements missing from the story, the actual production was really nicely done. Although not entirely my cup of tea, this version of Dracula has a lot going for it in many respects. A fascinating take on an old favourite in a perfect location. A new adaptation of Dracula receives its London premiere in February 2019 at the historic London Library – the venue where Bram Stoker spent seven years researching his gothic masterpiece and creating one of fiction’s most enduring characters. This atmospheric site-specific production, by Oxford-based Creation Theatre, transports the narrative to the 1950s, set amongst the emotional and social restrictions of the era. We meet a young couple reeling from their encounters with the demon Count. Jonathan struggles with his role as husband and protector, while Mina rails against the limitations placed on her as an intelligent woman. Dates: Sat 2 Feb – Sat 2 March, 7.30pm, Wednesdays to Saturdays.